Even though mulled wine should remind me of being in the church choir as a cherub-faced youngster and singing Christmas carols with frosty breath overlooking a seasonally-decorated nave and a sea of pink-cheeked parishoners, it doesn’t. In spite of this being the way I was introduced to this most famous Yuletide beverage, my abiding memories of it from childhood (before I ever got to drink any, I should mention) are of a warm cinnamon-scented aroma spiked sharply with the acrid tang of disinfectant and the musty odor of old people. And this, perhaps unsurprisingly, had put me off it until comparatively recently. You see, as part of the church’s annual carol-singing calendar, we choristers had to visit all the hospitals, hospices and senior citizens homes in town, and my sensitive smell-o-memory was scarred for many years by this revolting combination of smells. That was, until I visited a friend in the French city of Lyon around Christmastime a few years back. As an icy mistral wind blew down the Rhône valley, vin chaud or hot wine was being served out of a deep cauldron to chilled shoppers perusing the seasonal wares of Lyon’s famed Christmas market in Place Carnot. And I found the atmosphere of seasonal bonhomie, red noses, black tobacco, and warm, spicy alcohol irresistible. I’m not sure whether it was the cold, the booze, or the giant cans of duck confit and cassoulet on sale that so moved me, but from that moment on, I have been hooked on mulled wine. In days gone by, wine went bad pretty quickly due to poor bottling techniques, so during the Renaissance period, spices began to be added – as they were to virtually everything else in that time – to both delay spoilage and make spoiled products taste less nasty. 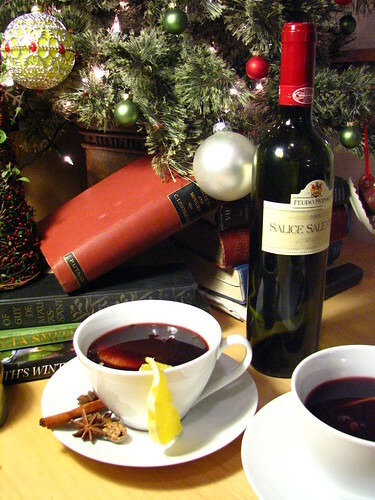 And since young wines were commonly bottled during the early fall, mulling (which originally only meant to ruminate or ponder lengthily) was necessary by Yuletide as some were beginning to turn to the dark side, and hence how the consumption of “mulled wine” became a holiday tradition. The exact combination of spices varies from country to country and person to person, but, on the whole, sugar, cinnamon, nutmeg, cloves and bay are mixed into claret or another Bordeaux to form the basis of flavors. Variations (and there are many) include the addition of mace, juniper, black pepper, dry citrus peel or vanilla, and substitutions include honey or molasses for the sugar, cardamom for the cloves, and brandy, sherry, acquavit, brenivin, fruit wine or vodka for the red wine. Mulled wine, aka vin chaud, gluhwein, glögg, vin fiert, vin brulé, quentão, is drunk in most European countries in some form or another around Christmas, but it is particularly associated with German and Nordic traditions where so-called “glogg” parties are a holiday season staple. At these shin-digs, the spiced wine is typically drunk with other Yule specialties including gingerbread, blue cheese and, perhaps rather curiously, rice-pudding. In my house growing up, however, we only ever had mulled wine when we were expecting company because my father, who has something of an intolerant nose for anything strongly perfumed, can’t abide the stuff, and, it being during the early 1980s, it was accompanied by cheese and pineapple cubes on toothpicks, cocktail weenies (chipolatas), factory-made mince pies, and potted shrimp. All of which is perhaps another reason why I didn’t really catch on to the subtle flavors and myriad charms of mulled wine until I’d left home. Optional: Tie all spices in a piece of cheesecloth using kitchen twine. You can skip this if you’d prefer to laugh at guests with cloves stuck in their teeth. Heat wine in pot gently with spices/sachet and peel until aromas fill the room (at least 15 minutes). Do not boil, only simmer very, very gently. Stir in sugar and orange juice. Taste for sweetness and adjust if necessary. Place orange rounds in mugs and ladle in wine. 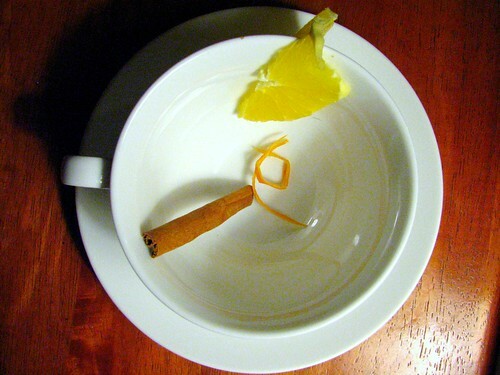 Stir and serve with a cinnamon stick and enjoy! I never had Mulled Wine. It must smell so good in the house. Merry XMas. Such warm and fuzzy photos and then…’acrid tang of disinfectant’, ‘musty old people’, “revolting combination of smells”…only in We Are Never Full! And that’s what keeps everyone coming back. Happy holidays to both of you. My finace is Norwegian and he and his friends are very serious about their glögg. I had it for the first time last Christmas and man, they can really pack that stuff away! The kind they made was from a bottle, but I’m sure this is sooooo much better! Love it! Good job, Jonny! I adore mulled wine and I miss Christmas markets! It’s just so perfect for a cold winter’s eve. 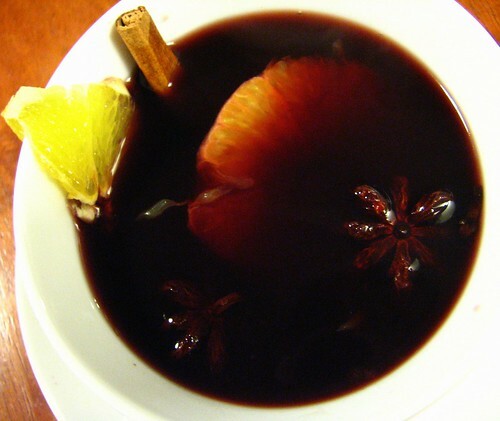 I’ve never had mulled wine…better make sure I get some…. My grandmother always gave me just a bit of her mulled wine and eggnog, on the strength that if the mystery was gone, I wouldn’t be a problem drinking teen. It worked out fine for me. I still love the smell of the cinnamon and spice! Great history lesson! I’ve been mulling spices in apple cider the past few days and finishing it off with a (generous) splash of port. Sometimes I make a granita out of mulled wine. Pretty good stuff. Thanks for the informative read! I’ve never tried this before but I must! Your pics for this post are especially beautiful.